When I think of sweatshirts, stylish certainly isn’t the first thing that comes to my mind. This fall, however, that’s all about to change as fashion sweatshirts are majorly trending. 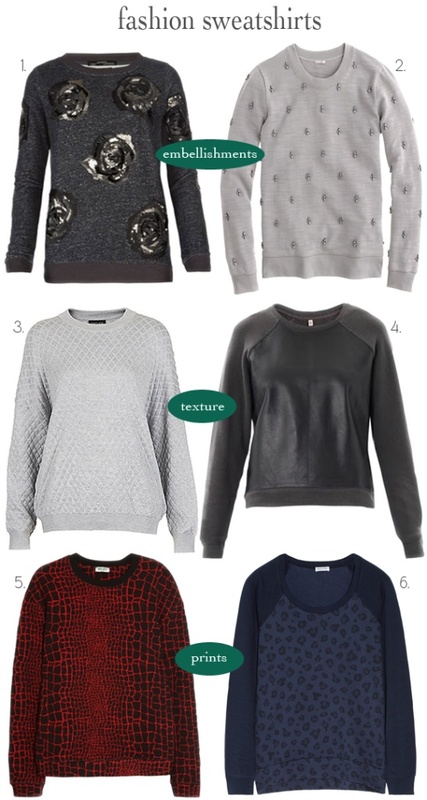 I was a bit weary of the trend at first; however, after perusing online I discovered many luxe sweatshirts that I adore. Sweatshirts are no longer frumpy and causal; they’re glammed up with embellishments like sequins and jewels, leather and quilted textures, and colourful prints and patterns. I love that you get the comfort and looseness from a sweatshirt, while being chic and modern. It’s also extremely versatile as you can wear it with pretty much anything. For a causal look, pair it with jeans or pants, or dress it up with a flouncy or pencil skirt.